The motivational saying “Keep Calm and Carry On” does not apply to enterprise IT professionals. Not anymore, unless they have their data protection and data risk management strategies worked out. Enterprise IT is facing persistent challenges to protect their data and secure their data center against cyberattacks and ransomware. On top of operational challenges to ensure data recoverability and availability, they now need to keep abreast of the shifts in legislative compliance requirements globally and in their territories, as these legislations would impact their businesses. Legislation and compliance requirements are becoming more stringent to ensure businesses handle data responsibly. We have read of many incidents of data theft and ransomware that impeded businesses and brought public services to a halt. Enterprise IT therefore, needs to have a holistic approach to data protection and data risk management. Dell EMC has commissioned a research project with IDC focusing on data risk management, to provide enterprise IT professionals with the latest regulatory compliance requirements and best practices to help them mitigate these risks. This research took the form of an InfoBrief and the focus is on data privacy and protection, specifically in Asia Pacific markets. It captures the main legislation that comes with punitive damage and provides organizations better understanding of the region’s patchy legislative framework. 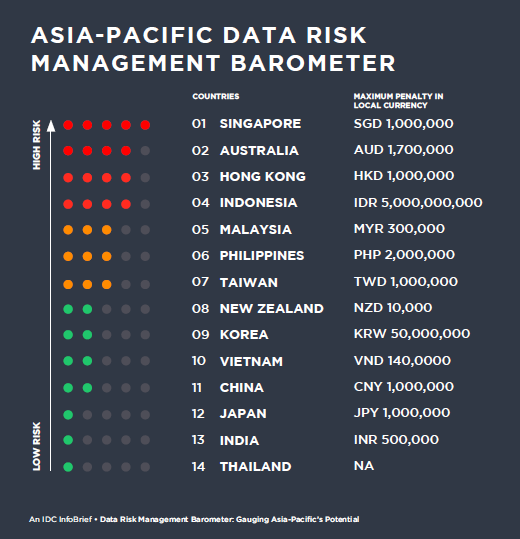 The IDC Data Risk Management Barometer shows a ranking of the markets based on the severity of financial penalties for non-compliance. How is the IDC Data Risk Management Barometer InfoBrief beneficial to enterprise IT? Understanding the legislation helps build the IT infrastructure for compliance, thereby helping businesses avoid breach of any legislation, which can result in potential monetary and reputation damages. It helps enterprise IT leaders in setting IT priorities and budget for compliant costs more accurately. Enterprise IT can be a catalyst in helping business units better manage their data in order to more effectively monetize data. To download the full InfoBrief and watch the executive video, visit the IDC Data Risk Management Barometer microsite.